So last weekend I'm sitting at my house with nothing to do and notice that I'm running low on cash and need to stop at an ATM in Shinjuku. At this point I still hadn't gotten a Japanese bank account (which I did this week, more on that later) so every time I needed to get money, I had to ride 30 minutes away to use a Citibank ATM which will directly connect to my US checking account. Since this was a bit of a trip, I didn't really want to go that far by myself just for that. 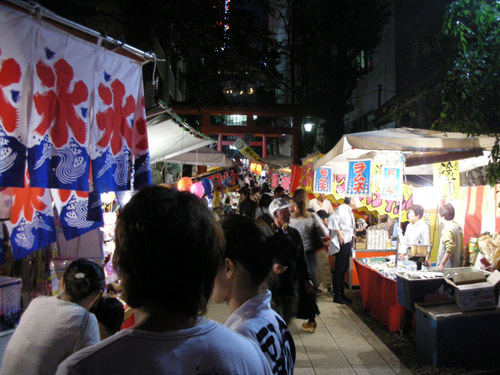 I invited Aika, a housemate of mine, to go with me to Shinjuku to do some shopping and exploring. 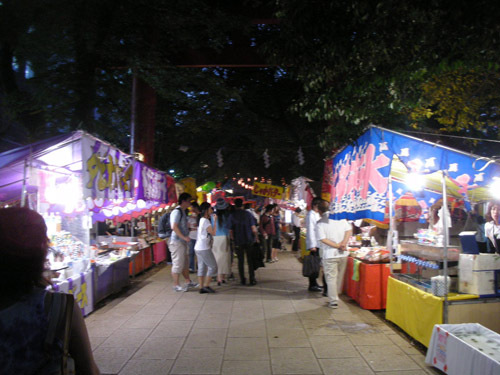 So I quickly finish up my business with Citibank and we proceeded to wander through east Shinjuku when we stumbled upon a temple grounds where a large traditional summer festival was taking place. 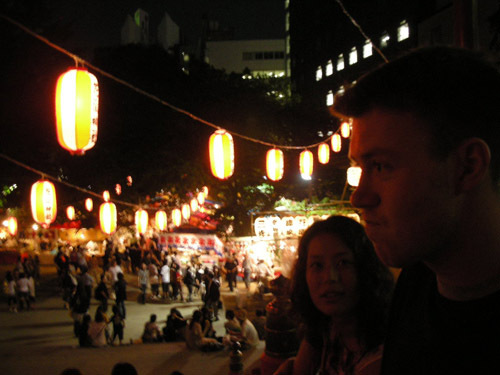 From time to time festivals are held on temple grounds and are a good way to soak up some real Japanese culture. We had nothing going on so we thought we'd stop for awhile and check it out. 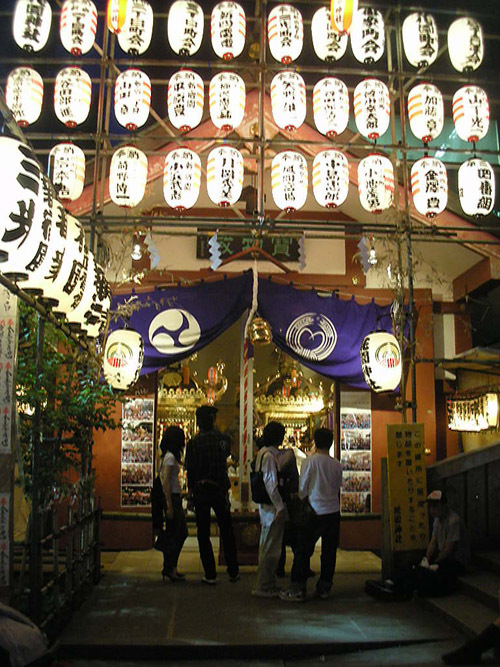 At the entrance of temples they have these gates called tori (or something like that). 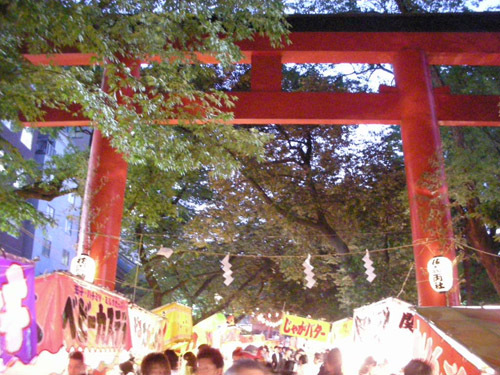 Here is what we first saw as we entered the festival. 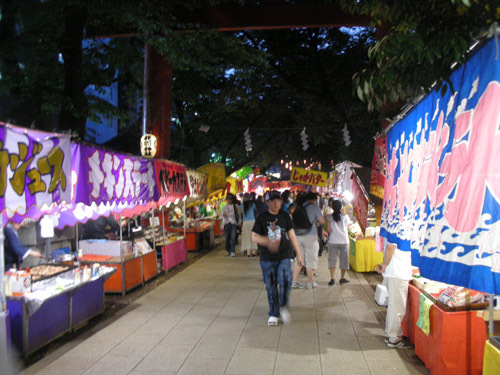 The festival is setup with many booths lining the walkways leading to the main temple where different vendors offer different famous festival eats, games, and shops. 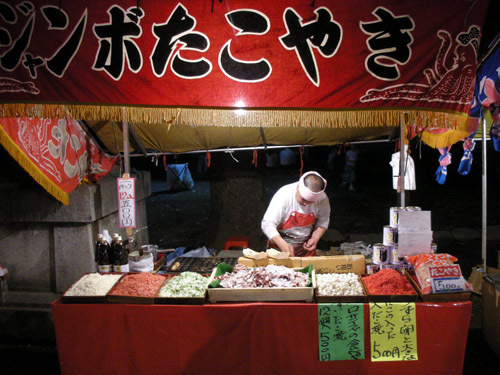 Here you can see an old man offering some delicious squid on a stick, called ika in Japanese . This was my favorite part of the festival. My favorite animal since I was a youngin' has been turtles. 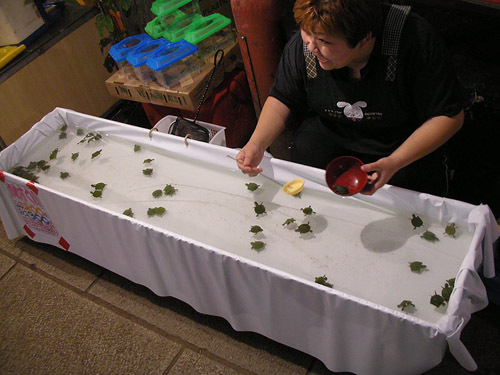 In this traditional Japanese game, you pay around $3 and you get a small scooper made of the same stuff as ice cream cones and you go as fast as you can to scoop as many baby turtles as possible before the scooper breaks from the water. You get to keep the turtles you catch as pets and then the vendor offers to sell you a small little reptile cage to carry them in. 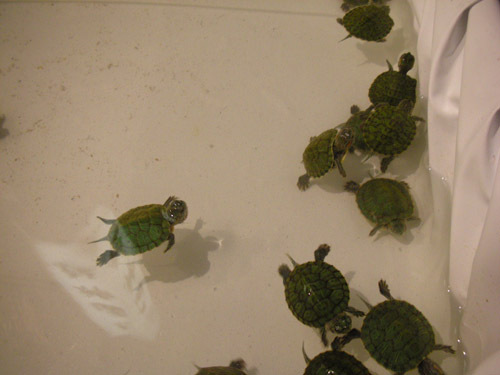 Look how cute they are though, and watching them swim around in fleets through the little pond was fun. 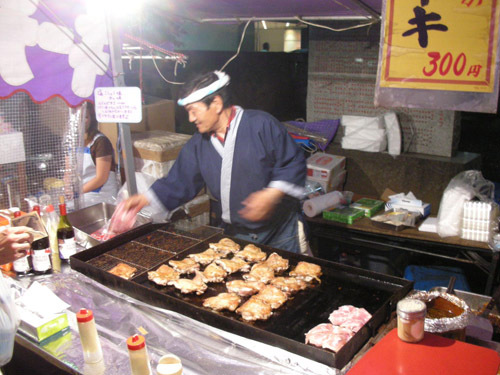 This extrordinarily jolly man was making chicken flavored with traditional Japanese seasonings and sauce. 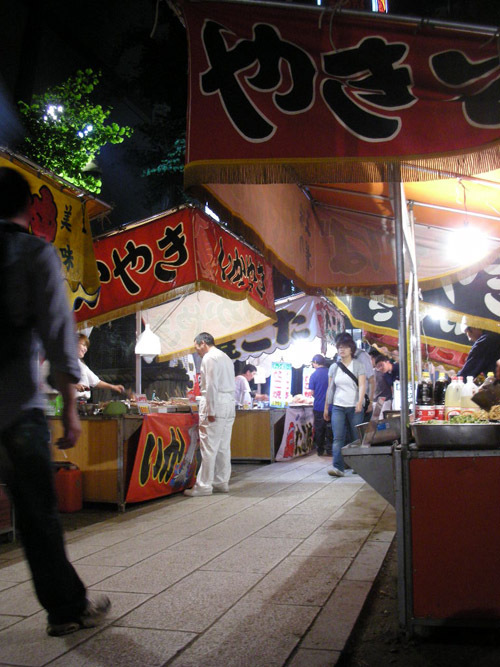 Aika bought some and we had a good time enjoying some great chicken. It was cheap too ($2.50). 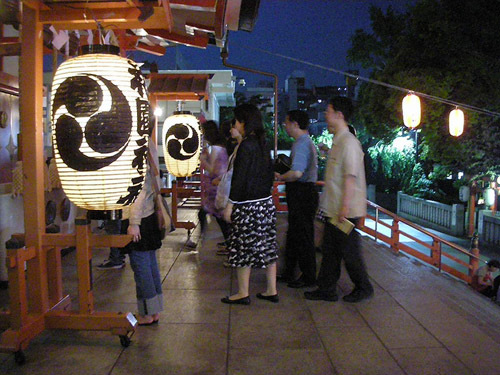 Here we are continuing through the crowd towards the temple. Look at this guy's desserts. Bananas dipped in chocolate then covered in sprinkles with a hat and face design affixed to the top. 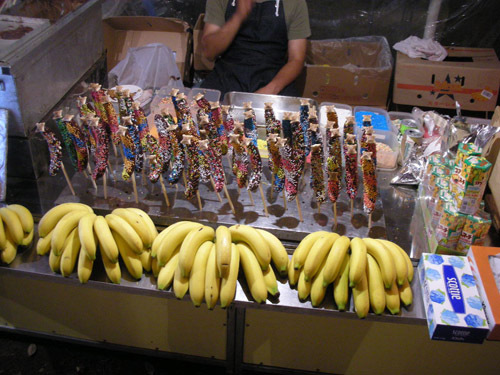 He tried to hard sell me his bananas but they just didn't look appealing enough to get 300 yen out of my pocket. They certainly look funny though. Ah some more food. 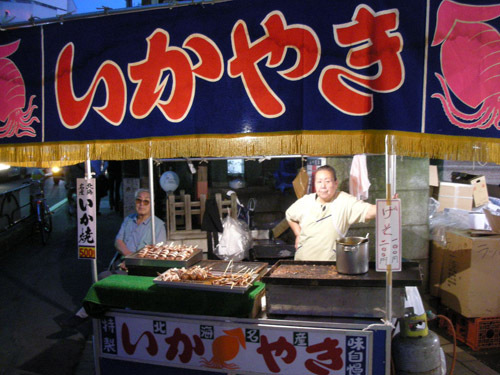 This is a really traditional food where they take difference vegetables then put them in batter and make a ball and bake it in these little cupcake-like fryers. 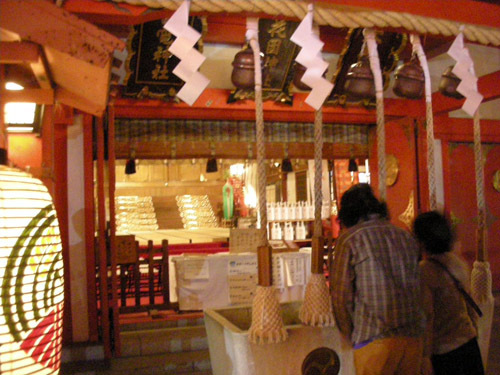 Here we are finally at the main temple. Wow, beautiful. 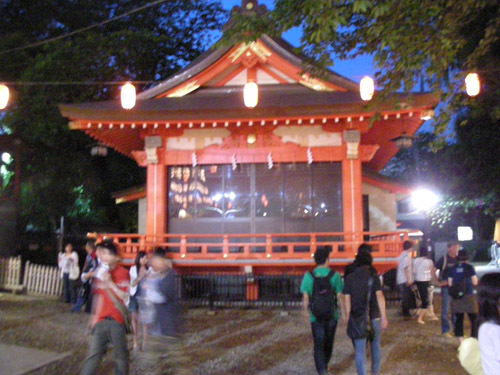 Directly to the right of where I was just standing, there was this mini..temple building. 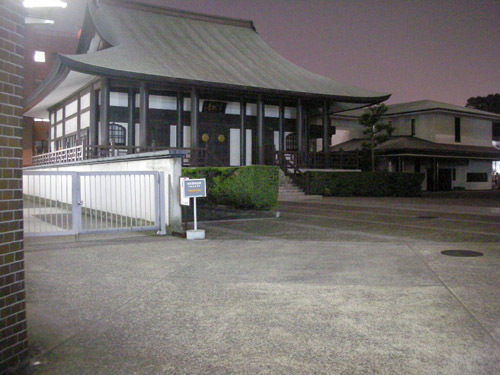 Then directly to the left was the second road/entrance to the temple from the main streets. 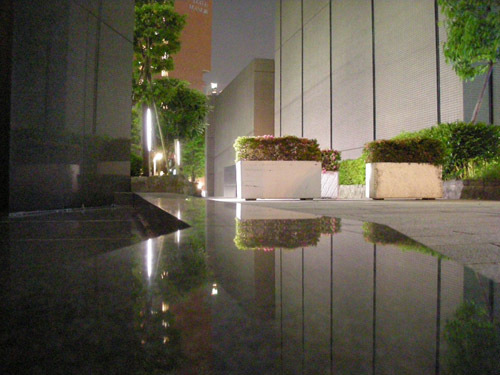 Very bright at night with nice colors. Pretty lamps too. There was also this lamp/building display. Inside those windows were large gold statues of pagodas or something. 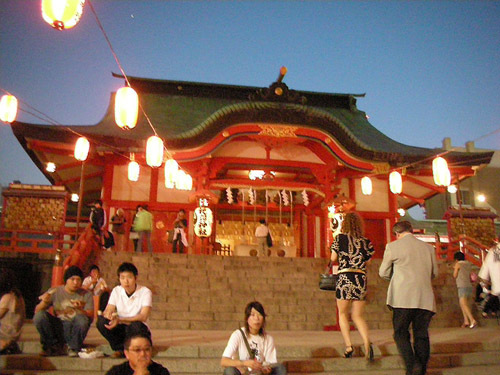 At the top of the main temple steps you can see people here offering some money to the temple then doing some short prayers. Turning a 180 from there, you can get a nice high view on the festival. That's Aika playing with her cell phone. 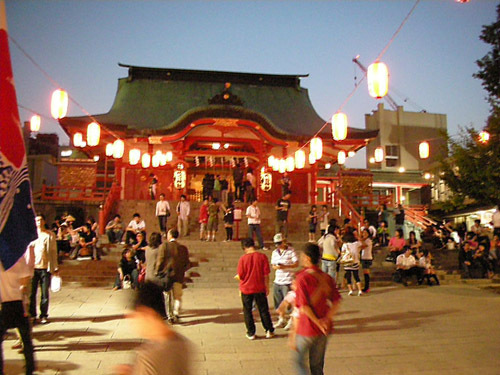 More people waiting to pray for good fortune. Making faces as I usually do. 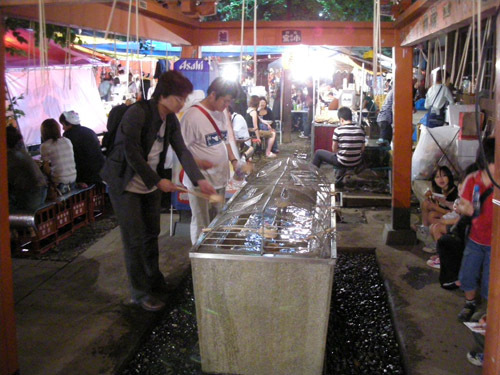 After walking back down the stairs we started to head to the second road of the fesitval and saw this cleansing..sink?> These are at all the temples I've visited in Japan and it has some religious value but the exact meaning escapes me at the moment. 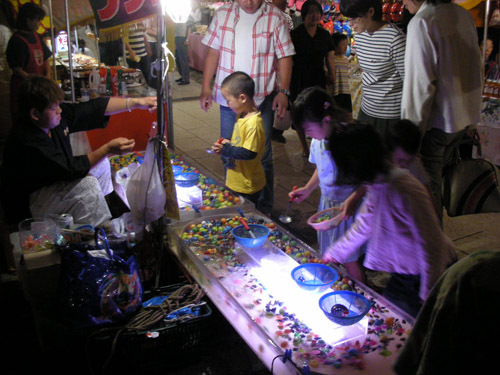 Some young Japanese children playing a festival game for prizes. This was my second favorite booth next to the turtles. This is fish or super large shimp stabbed on a pointy stick. In the center of the display he's got going, there are some hot coals. 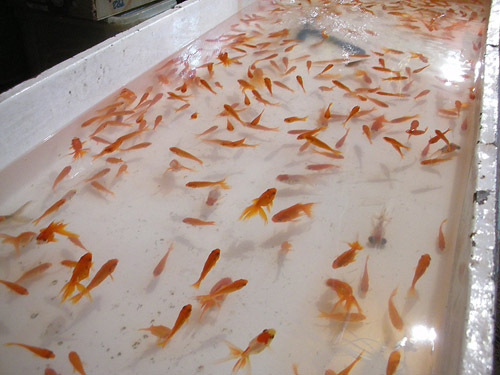 When you buy a fish or shrimp, it's placed directly on the hot coals and cooked fresh for you. It looks delicious doesn't it? On this road they had the goldfish version of the turtle game. 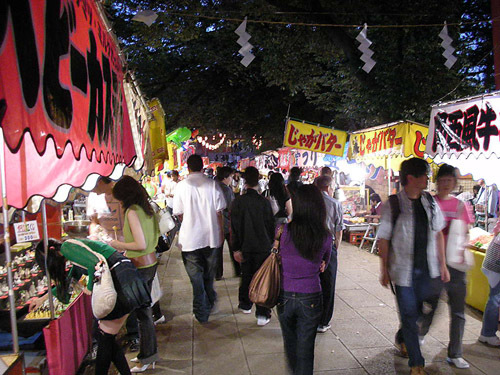 If any of you have ever watched alot of anime or Japanese movies, I'm sure you've seen this as it's a very popular game at these kinds of festivals. Same rules apply as the turtle game. Near the end of the second street. Many happy faces and gobs of kids running through people playing games. 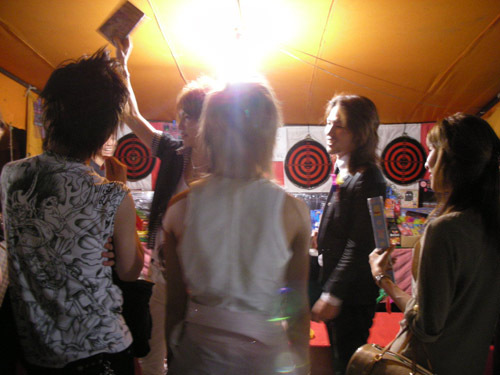 Here are some cool kids winning a DVD at a shooting game. With their pretty long hair and tight pants we thought they were women at first. 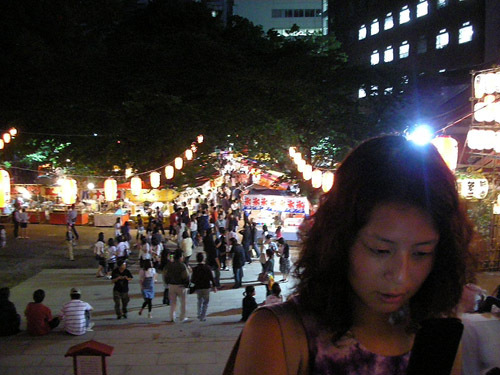 Hey, it's Japan, most the guys look like girls in Shinjuku and Shibuya. So if you visit, be careful before you comment on the looks of a girl from behind. Here is a well behaved dog just hanging out. 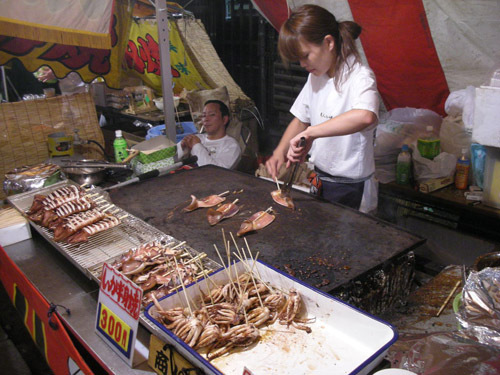 This cute girl is cutting up some squid on a stick. 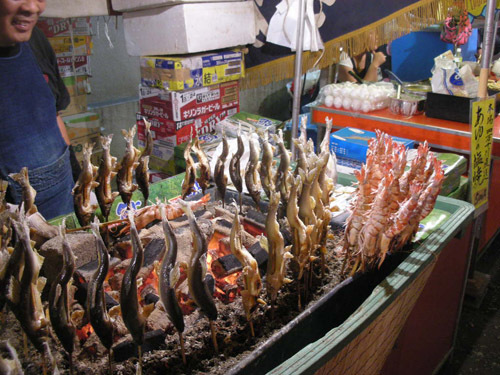 Her family's booth was offering squid heads and legs. And that ends it for the festival. 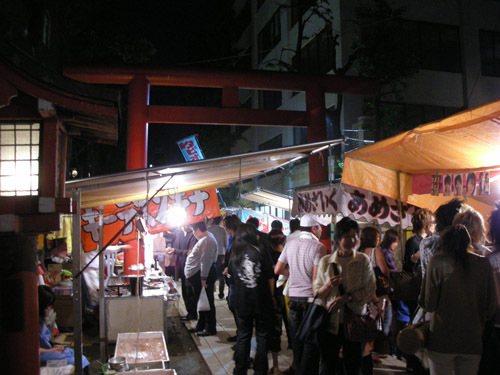 It was the first time I've been to one, and it was really cool. If you ever get a chance, check one out. And, of course, as soon as I walk out of the festival onto the main streets, I see a Lamborghini. 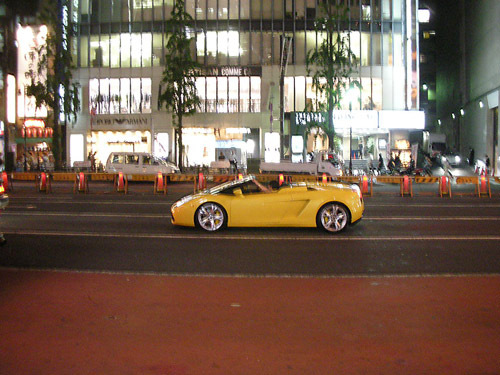 Japanese people and their rich exotic cars pfft. 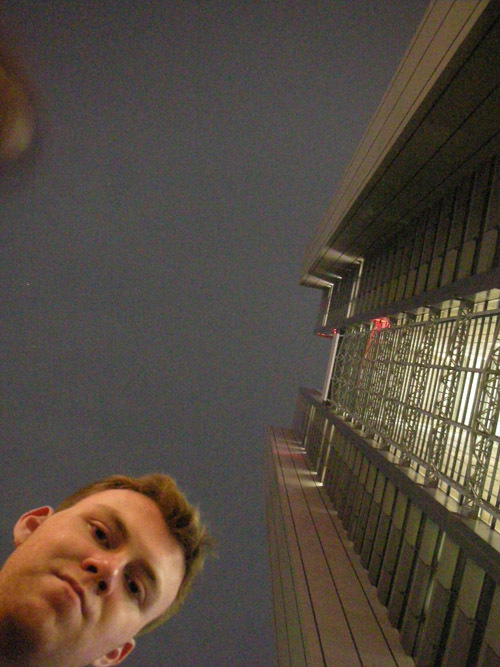 We continued to wander around a bit in Shinjuku afterwards and I saw this less active temple. Artistic? No I'm not a hippy. And this is my face. > Now this is the kind of post I can appreciate. Man, I can't wait to start my "Globe Trekker" journey. Man you should of yelled clam chowder!!! Just to see if theyhad any. I loved the little turtles, they were so cute!! I am finally back online and I just now got through all of your posts that I have missed...there were a lot of them!! 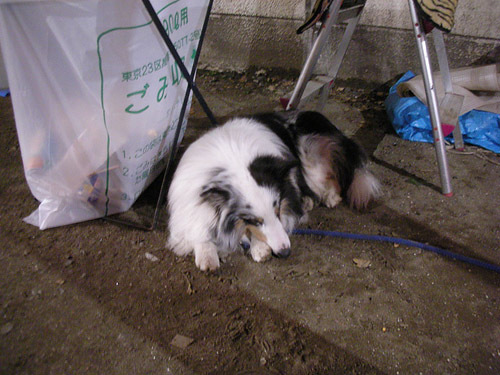 ... and a japanese dog.